Belle Beauty Rocks the stage! 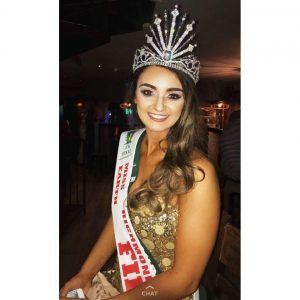 I absolutely loved helping to select dresses for the Miss Earth Northern Ireland 2017 competition in June. Belle customer, Arlene, came fourth place overall in her very first competition of this nature and looked stunning in both dresses from Belle Dress Hire. For the cocktail round we decided to go for a shorter length, gold sequin, strapless style and it fitted Arlene like a glove! The bodice of this dress is boned at the bust and gives a fabulous shape to the wearer, nipping in tight at the waist. The fabric itself is quite stiff and so sits really well, no wrinkles or folds to worry about when you wear this dress. Then for the remaining rounds of the competition, Arlene chose an AMAZING full length gown with ruffled full skirt, strapless, boned bodice in a green and navy animal print pattern. I know that sounds really bizarre but the pattern is very subtle and considering the pageant was called Miss Earth, we thought this dress was the perfect choice and again it fitted Arlene extremely well after a few nips and tucks. If you have a competition or special event coming up, contact Belle Dress Hire at www.belledresshire.co.uk to view more dresses available and to make an appointment. 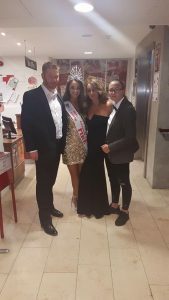 This entry was posted in Dress Hire Belfast and tagged belle dress hire, evening dress, miss earth by Leeanne. Bookmark the permalink.